In 2015, ALLIES supported collaboration between community based organizations (CBOs) and adult schools / community colleges by making mini-grants to ALLIES participants. The purpose of the mini-grants was to promote exploratory dialogue and action projects involving CBOs along with their colleagues in Adult Schools and Community Colleges. The grants funded information sharing, brainstorming and small tests of collaboration and alignment. Grant teams included a CBO collaborating together with at least one AB86 educational agency in each of the four AEBG consortia areas served by ALLIES. The 2015 collaboration mini grants provided an opportunity to begin a collaborative dialog and build relationships in advance of the implementation of the AB 86 plans. Not having reliable and affordable childcare options is one of the most pressing barriers adult English learners experience in accessing ESL and other adult education classes. Members from the San Mateo ACCEL AEBG consortium and their community partners used ALLIES min-grant funding to develop an initial landscape of childcare services available to English language learners in the San Mateo area. The team researched challenges around childcare and opportunities for future collaboration. A team composed of representatives from the South Bay Consortium for Adult Education (Mission College) and Catholic Charities of Santa Clara County worked on identifying key partners in the South Bay area and was successful in integrating the public library system into the ALLIES EPN network. 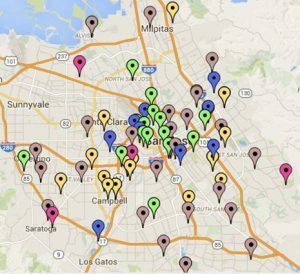 The South Bay team initiated relationships with the County of Santa Clara, specifically the ESL database and created a interactive map of ESL classes and other services available to adult English language learners. In North Santa Clara County, mini-grant project coordinators from Palo Alto Adult School and Vision Literacy worked on building and expanding relationships with the regional CBOs who attended the March 13th 2015 ALLIES EPN meeting (Building Skills Partnership – BSP, Cell-Ed and Vision Literacy) and others in the North Santa Clara County Student Transitions Consortium ( NSCCSTC) region. They initiated a ‘Student Ambassadors Project’ to address some of the barriers that CBO clients face that prevent them from accessing adult school classes, programs and training. In South Santa Clara County, the mini-grant project coordinated by Vision Literacy and Gavilan College focused on developing common assessment tools by clearly articulating programs and assessments; designating cut-off scores and creating a mechanism for appropriate placement into each program.